Our marine month continues as we swim out from the reef into the open ocean, where we'll be meeting one of the deadliest creatures on Earth. Plus, some good news about the Zika virus, how the cordless drill intended for space found its way down to earth, and the real-life spidermen of Cambridge University! US scientists have discovered that a drug that's already licensed for use in pregnancy can block the spread of Zika virus from a mother's bloodstream into the developing baby. Indira - Normally, the placenta is a fantastic barrier. For the most part, babies are born fine, normal. We found that the reason the virus was causing such terrible problems in the babies was because it was infecting the placenta and then from there directly, it could go into the baby’s circulation, and affect the baby’s brain. Knowing this, we started looking into – how is it that the virus is able to do that? There is essentially a garbage recycling system that’s found in the placenta as in other cells. This system is important – just housekeeping, cleaning up of the cell, and taking care of the bad guys or anything that’s broken and we found that the virus was essentially taking advantage of the system. And so, that led us to then looking at drugs that could block the system and maybe that way, block the ability of Zika to infect the baby. Chris - So can we unpack this slightly then? Explain a bit more about what this garbage system is that the virus is exploiting and how. Indira - Yes. Pretty much every cell in our body, all different kinds of cells have this garbage recycling system. Again, this is there to essentially protect us but many, many viruses and bacteria have developed ways to hijack the system and it turned out that Zika is no exception. It’s actually a little bit counterintuitive but it ramps up this garbage recycling system because we think it needs the end products of the clean-up and is able to use it to grow. so then we found this drug which happens to be used as an antimalarial – hydroxychloroquine. This drug has been known to block this recycling system. So we treated our animals that had been infected with the virus - pregnant animals - with this drug and found that within a course of a few days, it was completely able to block virus’ ability to grow in the placenta and is able to block any effects on the foetus. Chris - So you take these pregnant – in this case, you're doing this on experimental animals – you administer this anti-malarial drug, hydroxychloroquine, this we know because people have studied this for years, we know it inhibits this garbage recycling system in cells. Indira - That is correct. Chris - When it’s doing that, the virus cannot penetrate through the placenta. It stops it infecting the placenta and that’s its relay station into the baby so the baby is indirectly protected. Chris - Is it safe in pregnancy though because many, many people, when they're pregnant, they're very worried about taking drugs for obvious reasons. Is this drug safe? Indira - Yeah. It has been shown to be safe in pregnancy. It has – in the United States – been FDA approved and obviously, as an anti-malarial, it’s used all over the world. Additionally, this drug is used to treat pregnant women who have lupus. The baby is followed and there doesn’t seem to be any adverse consequences to the baby as far as we know. Chris - How long is the window period? By that, I mean after an individual contracts Zika infection, how long have you got to intervene with this therapy before it potentially can leapfrog into the baby via the placenta? Indira - Excellent question. We don’t have all the answers yet, but from our studies, we can say that if we treat the infected animals almost immediately or a day after the infection, we’re able to block the infection. Chris - Because one of the problems with Zika is that more than 80 per cent of people who catch it have no symptoms whatsoever. So if we relied on people reporting, “I might have been exposed” then we’re going to miss the vast majority of cases. So we would probably have to just encourage people at risk of infection to take this throughout their pregnancy, wouldn’t we? Indira - That is correct. that’s the one thing that we would definitely have to test because even though hydroxychloroquine has been shown to be safe even in the first trimester of pregnancy, there have been no studies that show what happens if one takes hydroxychloroquine throughout the course of one’s pregnancy. A team of real life spidermen at Cambridge University have invented a new, greener, cleaner form of artificial spider silk. Darshil - There's a fibre. Georgia - Here’s a fibre here. Oh my God! I can barely see it. Are you sure there's anything there? Darshil - 6 micrometres in diameter. Typical human hair is 80 micrometres in diameter so it’s really, really fine. That is why we need to convert it into yarn so that they are useable in engineering applications. Georgia - This miniscule thread that I'm trying to look at is the new greener way of mimicking spider silk. The new method which doesn’t require extreme heat or toxic chemicals uses a hydrogel which is 98 per cent water and 2 per cent silica and cellulose. Yuchao Wu, a co-lead and PhD student at the Department of Chemistry told me where they got the idea. Yuchao - If you look at the way a spider produce spider silks, the content inside their gland contains lots of proteins. These proteins have amorphous domains and crystalline domain which are soft and hard. So this is what we’re trying to reproduce. Georgia - So you looked at how they do it. There's hard stuff in there, there's soft stuff in there. it’s all mixed together and you thought, “Let’s do it the same way” and that’s how you came up with your recipe, I suppose. Yuchao - Yeah. Just imagine you go to the restaurant and you order some spaghetti. The spaghetti are the soft polymers while the meatballs are the hard silicon spheres. So when they mix together and there are some interaction between these meatballs and the spaghetti, in that case, the extension of the material can be extended into very large extent, and that’s why this material can be pulled into a fibre which has a very high aspect ratio. Georgia - This aspect ratio refers to the relationship between width and height i.e. these threads can get very, very long and thin. Now, I wanted to see how this liquid hydrogel was spun into a thread. Can I have a look at your machine? Do we have to run through the rain to get there? Darshil - Yes. There are some bits through the rain. Darshil - So we are just about to run a sample of the hydrogel and show you how the fibre forms from a reservoir of the soupy material – the hydrogel which is 98 per cent water – and we can pull a fibre from it up to around 250 millimetres in length. Georgia - So the machine itself, it’s two little crocodile clips stuck onto these sort of pillars reaching towards each other. I'm assuming that is between these that the fibre will form. So we’ve got a tiny little blob of it. It just looks a bit like clear glue and now, the magic happens. Georgia - Here we go… it’s stretched out about 7 centimetres there. It was getting very, very thin but the blobs of glue were kind of stretching out to form this long fibre. Is that how it’s done then? Darshil - Yeah. So basically, it draws and pulls out material from the reservoir and eventually, because the aspect ratio becomes very large, water starts to evaporate, and you're left with an entirely fibrous material based on modified silica and modified cellulose. Georgia - You’ve got a green way of doing it. But isn’t the most green way just to get spiders to do it? Why can't we just have a room full of spiders making silk for us? Darshil - First of all, spiders are cannibalistic in nature. So, what we find is that if you have many of them in a very small space, they will start eating each other up or protecting their own territory. And also, milking silk from spiders is quite a difficult task. Georgia - Finally, have you compared this in strength and resilience to the traditionally made spider web? Darshil - Yes, we have. So we have compared it to many other technical fibres and we found that the damping capacity of our fibre which is the ability of the material to absorb energy exceeds that of natural silks. So the application of these supermolecular fibres would probably be in technical textiles, particularly where energy absorption is important such as in blast proof shrapnel resistant military clothing, silk cloth for sailboats, fabrics for parachutes and air balloons, protective gears and devices such as helmets for cyclists and skateboarders, and finally, as sensors because we can alter the chemistry by introducing tiny amounts of other materials, and we can use these fibres for sensing applications and help monitoring. This is an important field of engineering to ensure safety, reliability, and functionality of a structure. 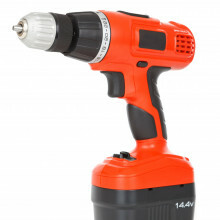 The technology to help astronauts dig holes in the moon makes its way down to earth in the form of the cordless drill. Stuart - What happens when the science and technology of space comes down to Earth? Hi, I'm Dr Stuart Higgins and welcome to this episode of Down to Earth from the Naked Scientists – the mini-series that explores how technology developed for space is also used back down on Earth. This episode, how developing an astronaut’s drill to dig holes in the moon helped lead to the development of cordless vacuums. In 1968, NASA launched the first of the Apollo programme missions to the moon. As well as the ultimate goal of being the first to put humans on the moon, the Apollo programme was also used to conduct scientific research. This included drilling holes into the moon to remove samples for testing back on Earth. The 6 Apollo flights that landed on the moon returned 382 kilograms of lunar material including core samples. These samples reveal much about the composition and origin of the moon, including that the moon may once have had its own magnetic field. In order to get samples deeper from the moon’s surface, the Apollo astronauts needed a drill. Just like using a vacuum cleaner or a hedge cutter down on Earth, the astronauts didn’t want to have to run long power extension leads across the moon back to their lunar landing module. So instead, NASA looked into developing a cordless battery-powered lunar drill. They ended up working together with Black and Decker – a power tools manufacturer – who in the early 1960s released the first cordless electric drill and a cordless hedge trimmer. Traveling as far as the moon takes a lot of energy, so NASA was keen to minimise the mass it needed to transport. Batteries were heavy and bulky. To minimise the number required, an efficient electric motor was needed in order to cut down the power demands. Engineers from Black and Decker developed a computer programme to optimise the electric motor’s design, reducing the energy needed. The end result was a drill that could operate from about 40 minutes from its 3.3 kilogram power supply. And granted that’s still pretty heavy but not bad considering the amount of energy needed to drill into rock and sand. This drill subsequently went to the moon on the Apollo missions and was used to bring back core samples to Earth. Black and Decker went on to use the skills and expertise they developed to create products such as the cordless vacuum cleaner which has been sucking up crumbs ever since. 14:47 - Stairs that give you a leg up! Scientists in the US have come up with a set of steps which store the energy you expend when you descend, and then give you a helpful “leg up” when you go up again. Lena - So we start at the top of the stairs and each of the treads move up and down, just the height of one stair. And when you step down, the stair starts at the same height as the floor that you're on and as it accepts your weight, it slowly lowers, stretching some springs. So, it cushions your descent of the stairs and actually reduces the amount of work that your muscles need to do and, actually, makes it quite soft and pleasant to go down. Katie - So the energy is being stored in the spring, right? Lena - That’s right. So, you're using your own power to stretch the springs. When the tread lowers by one-stair height then it gets locked in. And so now, we’ve locked in that energy into a stretched spring, and you go down a series of stairs, and the stair treads get locked. 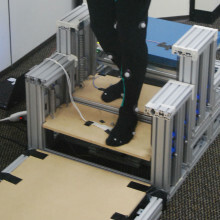 When you turn around and you want to go back up the stairs, now the energy is stored in each step and we have some simple pressure sensors on each tread that senses when you put down one foot and when you put the next foot on the higher tread, it releases the back tread, and that gives your back leg a little push up. Katie - Okay, so the energy is being stored on the way down and it’s being used on the way up to give you a little boost just to help you get back up the stairs. Lena - That’s right and we found that that boost to what we call the trailing leg reduces the amount of work done at the knee of the leading leg by about 37 per cent. Katie - Okay, so that’s the energy being saved in a sense I guess by going up the stairs, but what about going down the stairs? Does it have any benefit there? Lena - What was surprising is that the amount of work going down which is generally used to break the body to keep us from falling against the pull of gravity, also decreased by about 27 per cent in the ankle. So it’s energy that’s dissipated and the stairs work on a principle by helping you do the breaking, so you use less energy. But then we also store that energy so that it can be used going back up. Katie - Ultimately, why is this invention important? Lena - Well, I think we all know, people who have difficulty walking up and down the stairs, either because they're ageing or even have a temporary injury such as knee surgery. These allow people to climb existing stairs that are very difficult to retrofit or you might not want to retrofit them. It also allows people to take advantage of the mobility that they have. So, if you're able to partially walk up and down the stairs then this can keep people active, independent and living in their own homes. Katie - So it sounds like these stairs would give people who can do a bit of exercise, that freedom still to move around and not be confined to – like you said – a lift chair or something. Lena - Participating in going up and down the stairs is very important for maintaining the mobility that somebody has. If they were to start using the chair lift then because our mobility is ‘use it or lose it’ then their motor ability may in fact degrade faster. It’s extremely important that we keep active and maintain independence as people age. How accurate is the primate science in War of the Planet of the Apes? with Lauren Brent, University of Exeter and Zanna Clay, Durham University. 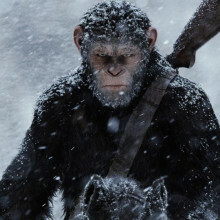 Georgia - War for the Planet of the Apes is the third film in the reboot of the 1968 classic. It’s a sci-fi but how accurate is the sci? Could apes really rise up, start talking, go to war with humanity? At a screening of the film, I found some people who were able to help, some primate experts who could tell me just how well the movies ape the apes. Lauren - I'm Lauren Brent. I'm a behaviour ecologist at the University of Exeter. I really am interested in societies and how they're structured, and how individuals relate to each other in those societies. There are many ways that the films are quite accurate in that. So chimps are a patriarchy. There's a dominant male who gets most of the resources. He leads groups. Everyone needs to submit to him and that’s really borne out in the films. And also, they're highly competitive, both within their group and also with outgroup members. So in this case, those are humans, but if we imagine in the wild, it would be a rival chimp group that bordered their territory. There were a few things that aren't what chimps do, so they're not monogamous. So you wouldn’t have a single female partner where you had all your children with her, but there are lots of reasons why what they’ve portrayed in the films are fairly spot on in terms of chimp society. Georgia - And let’s speak of some speech a bit because in the films, they do speak – the apes – and they also sign, so are these things we think apes can do or could ever do, or is it completely in the realms of sci-fi? Lauren - I think a lot of it is in the realms of sci-fi in terms of the level of intentionality in the communication. Signing is certainly something you can train an ape to do, but the extent to which they then apply syntax and create sentences, that’s getting a little bit into the realms of science fiction. And certainly, the vocalisations, apes are limited in the sounds that they can make for a variety of reasons so the types of sounds they were making basically English speech is something that current apes that exist for a whole host of reasons probably can't do. Zanna - I'm Zanna Clay. I'm a comparative psychologist at Durham University in the UK. In terms of their vocalisations, the naturalistic data suggests actually, largely they lack a lot of the skills in terms of learning new vocalisations and intentional signalling that humans have to use for language. But actually, captive apes and there are some interesting data suggesting that captive apes actually are able to use new vocalisations. They're not necessarily using their vocal tract but they're using, blowing air through the throat and so on. They can produce novel sounds, so it’s not completely out of the realm of science fiction. It could just take one or two genetic mutation that could actually create more flexibility than we see. So these weird sounds that captive apes make, they seem to be able to control those. If they could speak, they really would like they want to communicate, they want to ask for food and so on. The best they can do is go “oehhh”. So, there is an intention there but they're lacking the machinery. Georgia - So a big part in this film is motion capture and the actors are acting like apes. So say, I'm Andy Serkis asking you for advice on how to look like an ape, what advice would you give? How do you act like an ape? Zanna - Yeah, I spend a lot of time watching individual apes. You can really ape an ape by using the right body movements. It’s hard to ape an ape in a bipedal posture because mostly, really quintessential mannerisms you see in apes is how they use their body physically on the ground. There's also some specific facial expressions that apes show. Not all of which map directly onto what we see in humans. So, it’s hard for these actors to appreciate the differences between certain emotional expressions or facial expressions that you see in great apes like chimpanzees. But there are some really interesting crossovers. And then I think also the use of like, eye gaze and attentiveness is a bit different in apes. So I think it’s important to look at how they respond to others. Chimps are easier to imitate vocally than gorillas, orang-utans, and bonobos. Georgia - Give me your best chimp. Georgia - Do you do the chest beat of a…? Zanna - I'm not going to do it because that would be really loud. I mean, maybe if I’d had another glass of wine. I can also do food calls like (making a chimp food call sound). That’s like a happy food call of a chimp. And a laugh – I could do a laugh (making a chimp laugh sound). Georgia - And they generally do that when they're finding something funny? Zanna - They do, yeah. That is really what they sound like. It sounds a bit of a demonic laugh but that’s what they do. Georgia - So, we can breathe a sigh of relief. While chimpanzees enjoy a fight or two, we’re not in danger of smack-talking or any kind of military organisation. But they might just enjoy a laugh at our expense. 28:14 - What have marine microbes ever done for us? Our lives ultimately depend upon some of the smallest life forms on Earth - the constituents of the ocean microbiome. What have marine microbes ever done for us? Michael - When you first look at seawater, it’s this translucent liquid. If you're lucky, you might see a fish, you might see a whale. But actually, within that seawater are a huge number of marine microbes. You talk about 10 million viruses and million bacteria or a thousand microbes and eukaryotes that we call protists and that literally is one drop in the ocean. Katie - These billions of microbes together are known as the ocean microbiome. This is a concept we’re quite familiar with, the microbes both on and inside us make up our own unique human microbiome. Michael - So particularly, the microbes that are in our gut. They help us to digest food and we wouldn’t really be able to get the same nutritional value from food that we would without those gut microbes. Microbes in the ocean are sort of similar. There's lots of them. They're diverse, and they all have really important functions. It’s those functions that really help the ocean to work. Katie - What are they actually doing in the water? According to Michael, both the ocean and us would be pretty stuffed without them. Michael - Collectively, we could consider the marine microbes to be environmental chemists. They're performing all of the chemical reactions that are needed to sustain the chemistry of the ocean and the chemistry of our atmospheres. Microalgae, phytoplankton photosynthesise in the same way that plants and trees are on the dry land, and the scale that this happens is huge. So basically, half of the global photosynthesis is performed by these phytoplankton. 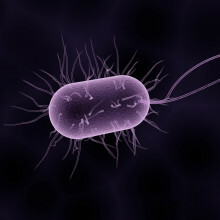 So that means, half of the oxygen that we breathe comes from these little unicellular plants that live in surface water. But the other big function that marine microbes have is this base of the marine food chain. All of the larger organisms that live in the sea rely either directly or indirectly on microbes. Katie - As microbes in the ocean are so fundamental to the life in the seas, understanding the effects that humans might be having on these tiny creatures is big business. Michael - Thinking about change and the impact that humans have on the marine environment, there's evidence that actually, microbes can respond to that and actually help to mitigate the impact that we have. Katie - So they're cleaning up our mess essentially. Michael - Yeah, to a certain extent. There's a really brilliant example of that and that was the Deepwater Horizon oil spill that occurred in the Gulf of Mexico – absolute horrendous environmental disaster. All this oil was produced and had a devastating effect on the ecosystems in the area. But one of the really interesting things that happened was, immediately after the oil spill, microbes increased in abundance. They were specialists in degrading oil. They played a major role in reducing the impact that the oil pollution had. Katie - What about plastic because plastic seems to be a real problem in the oceans? Michael - This is a Holy Grail really at the moment to marine microbiology. If you put plastic in seawater, very, very quickly, microbes colonise plastic and work has been done at these different locations around the planet, looking at different types of plastic showing that different sorts of microbes grow on them. So, there's a huge research effort at the moment to try and see if any of these marine microbes are actually able to degrade plastic. If they are, we could maybe look at the enzyme systems that they use and see if we could exploit that to try and deal with this pollution problem. Katie - There's so much we don’t know about this mysterious environment under the waves. Perhaps ocean microbes could hold the key to a treasure chest of untapped scientific potential and scientists are scouring the seas in search of the next novel compound – a process known as bioprospecting. Michael - There's a whole area of marine microbiology now where people are looking at the functional roles that microbes have say, “Well actually, can we bring them into the lab? Can we bring them into industry? Can we bring them to biotechnology? Can we actually use them to our advantage?” One of the really exciting areas is basically looking at marine microbes as a source of antimicrobial compounds. So I'm sure everyone is familiar with the major problems that we have at the moment with microorganisms that cause disease, that are resistant to antibiotics, and the problems that people have especially when they're in hospital. There's a real demand now to try and deal with that. Scientists are looking at microbes that live in the ocean and seen if they have any solutions. So, are any of these organisms producing antimicrobial compounds? One of my colleagues at the University of Plymouth is looking at marine sponges and they're trying to identify – are there any antimicrobial-producing microbes in marine sponges? The greatest migration on the planet occurs every day, in the ocean, and vertically. Kate - It’s called a diel or daily vertical migration and it is the largest migration that happens on the planet. It happens every day and it’s maybe only countered by human commuters as far as biomass. Chris - Well go on then, put some numbers on it. What's happening, who’s moving, and how far are they travelling? Kate - So, a lot of stuff is moving. So you’ve got living at the surface at the top 200 metres are your phytoplankton that’s kind of like the grass that all of your herbivores are going to be eating. 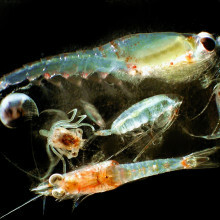 And so, the tiny zooplankton like copepods like plankton from SpongeBob SquarePants, they want to eat this phytoplankton. However, there's a lot of bigger things that want to eat them and they use vision in order to locate these copepods. And so, as a way to avoid being eaten by a visual predator, they go down to where it’s darker at greater depth in order to avoid these predators, and they do that during the day, and then at night, they come up to feed. And so, it helps them eat while not being eaten. Chris - How far do they travel? When you say they go down, are we talking hundreds of metres that these little animals might move up and down? Kate - Yes. So that’s interesting. The really little ones I believe are more restricted to the top 200 metres but diel vertical migrations have been documented down to 200, 800, and even 1400 meters which counts as the deep sea, and it’s all based off of the sun cycle. Chris - It’s quite impressive for a small creature that you'd really need a magnifying glass to see clearly. Kate - So, it’s more like a chain reaction. So the little guys will be more towards the surface and then the bigger ones that eat them will migrate with them, and follow them, and then the bigger guys who eat the bigger guys – it’s like a chain reaction. Chris - And everyone is going up and down every day. Kate - Everyone is going up and down and everyone is dying, and everyone is pooping. And so, all that death and poop just rains down on the deeper parts of the deeper layers of the ocean, and that’s what everyone else eats. So they're going to move up and down with all the poop and death, and stuff that’s coming down because that’s how they get the things they need to survive. Chris - Ultimately, is there rainfall that lands on the ocean floor because if you’ve got lots of stuff at the surface capturing energy because you’ve got plants up there, you’ve got animals up there, they're capturing energy from the sun, they're capturing carbon from the air in the form of carbon dioxide, some of them are not going to get eaten. Are some of them going to land on the seafloor and effectively carry carbon down? Chris - So it’s actually very important sort of drawdown mechanism for planting carbon seafloor-wards. If we disturb that, we could have trouble. Kate - Well, at least the animals in the deep sea will have trouble. Chris - Now you mentioned that some of these animals can use their visual system to spot these things going up and down and follow them. How developed are their visual systems then and what are they looking for? What can they see? Kate - Oh, they're fantastic! We’re talking baby crustaceans, other types of crustaceans that are fully adults and just swim around in the open ocean. We’re talking larval fish, full grown fish, sharks, dolphins, whales. I mean, everything is swimming around looking for something to eat all the time. So you’ve got the full spectrum of eye types. So you’ve got eyes that are just simple little eye spots that can detect a shadow versus not a shadow, all the way up to a great resolution eye that’s more like ours, designed like a camera that can really see something in great detail. Chris - I often wonder when I look at something like a shrimp or a crab and it’s got these little eyes on storks or whatever, how good is its vision? Kate - Well generally, their resolution is a bit poor. They have what's called a compound eye. So it’s an eye that’s made up of a whole bunch of little units. Imagine a bouquet of straws and each straw is almost like a little camera itself where it’s got a lens on the end and then a piece of film at the base. And so, it’s sampling each point in space like a pixel. So, each one of those pixels gets assembled into a picture and it’s just going to be a low resolution image, so there's not going to be a lot of pixels or as many as you would have in a camera-type eye like ours that has much, much smaller cells in it so you can pack a lot more pixels into it. Chris - But obviously, good enough that it can find something to eat and avoid being eaten. Kate - Yeah, exactly. So you don’t need a lot of resolution in order to see something coming at you that you don’t want coming at you, or see something that you want to pursue. 39:32 - Drones have a whale of a time! Scientists in Perth, Western Australia are using drones to collect samples from whales to study their health. Drones have a whale of a time! In the past many species of whales were hunted for their oil to the point of extinction; thanks to international treaties observed by many countries whale numbers have since begun to recover. But we still know relatively little about them, and it’s hard to conserve something that you understand only poorly. At the same time, you don’t want to distress or disturb an animal in an attempt to study it. Garth - The phenome is effectively the entire biochemistry of an organism as reflected by the interaction between their genes and the environment. In many respects, it’s the closest representation of the final physiological state of an individual – say, a human or another organism. And so, it’s reflective of everything that is potentially coded within the genes and then all of the other influences that then lead to that final state of the organism. Chris - What sorts of things do you measure? What sorts of samples do you have to collect to do that? Garth -So the key focus is on urine samples and blood samples, but there are other sample types that can also be analysed. In these analyses, we’re looking for all the small molecules – so the carbohydrates like the sugars, fats, proteins, amino acids specifically as well, and then a lot of other smaller molecules, and of course, anything that maybe not normally found within the organism; so maybe drug molecules or molecules that are present from food or environmental exposures as well. Chris - What sorts of gadgetry or expensive equipment do you need to make those measurements? Garth - So this is primarily achieved through a combination of two technologies – liquid chromatography which separates the molecules on the basis of their chemistry and then mass spectrometry which actually analyses the molecules and gives us a measurement of their specific mass that allows us to identify them and figure out what they are. Chris - You can do this fast enough to actually make this a practical diagnostic tool. Garth - The goal of the phenomics concept is to actually take these analyses which have typically been undertaken in a relatively slow fashion and now, make them higher throughput so that we can do them in a setting that is relevant to clinical diagnosis. Chris - Just human medicine or are there other things you could do with it? Garth - Absolutely, it can be applied to any biological system. The driver has certainly been medicine, but there are many other applications including agricultural settings and also in wildlife biology as well. 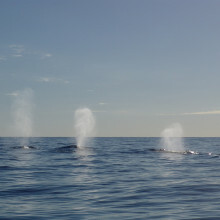 Garth - So, an investigation we’re undertaking at the moment is to look at the breath that is exhaled by whales and dolphins. Chris - Breath of a blowhole?! Garth - Okay! So the "blow" that is provided by these animals! Breath analysis has been undertaken in humans. For some time, it is actually growing in popularity as a means of diagnosis because it’s really easy to collect. And so, that thinking has now led to a few studies which have started to look at whether we can do this in the large aquatic mammals. It’s very difficult to sample from these organisms. It’s difficult to get close to them safely. Many of them are threatened or endangered species, so we don’t wish to interfere with them in their natural environment. So ideally, we’d like a way to sample from these organism that is non-invasive, and one of the ways that we can potentially do that is to sample the blow that is exhaled by them as they surface. Chris - This sounds very impractical. What are you going to do? Chase a whale down and every time it breaths out, you just try and catch some of the breath. Garth - That’s a very good question. With things like dolphins which are often found closest to the shore, there are dolphin populations around Perth that are used to interacting with humans. So we can do that using basically a pole with a collection device at the end. For whales, the approach is actually to use drones. So the drones fly over the whales as they are approaching the surface and then hover over the animal. Once it then blows out its breath, that can then be sampled and then brought back to researchers on a boat. Chris - What chemicals are in the breath that you can look at then? Garth - Hormones – so things like cortisol which can be used to examine the stress levels of the animals, and at the same time, some of the hormones associated with pregnancy; things like progesterone may be able to determine the pregnancy status of the animal without having to conduct more invasive measurements. Chris - And there's enough of those things in trace amounts in the breath for you to see that. Garth - It’s very much a work in progress, but it seems from the literature, there are studies that have been undertaken so far that these analyses are actually practical from breath analysis. Chris - You, presumably, are not just starting to try it out in the ocean with a team of drones. How are you sort of scaling this? How are you doing the preliminary studies? Garth - So we’re undertaking some lab-based simulations at the moment to make sure that the technology is up to the task. Then we’ll move on to dolphins. They're more easily interacted with and they're used to humans being around them so we’ll undertake some preliminary work with dolphins. If that all goes to plan then some of our colleagues from the Murdoch University Cetacean research unit will actually collect these samples for us using their drone systems. Chris - How much breath do you need? Garth - It’s been suggested that maybe a single breath from one of these animals or potentially up to 3 or even 5 breaths. But that’s the maximum we’re trying to collect from a single animal so we don’t unnecessarily bother them by flying a drone over them for extended periods of times. So, we’re thinking it’s probably going to give us around maybe 0.1 mil of actual exhaled breath condensate from which we can sample. The ocean is a noisy place! 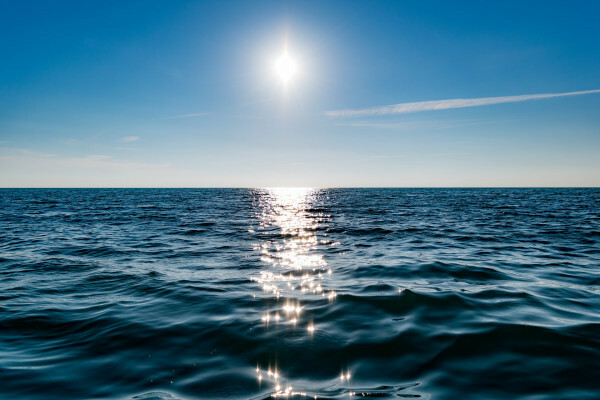 Underwater acoustics explores what the watery world sounds like and what impact humans are having on it. Philippe - The world of underwater acoustics is listening to the sounds in the oceans. Even if Jacques Cousteau called it the world of silence is actually very noisy. It’s hissing, crackling, sizzling, and we can hear the sounds from natural processes – the wind, the waves, the rain, or the storms above. We can hear the sounds of the animals around – for example, this whale, but the dolphins we heard about earlier. All these animals make their own noise and then with the noise we create with ships passing by or with our own tools – for example, sonar where we sent pings in the oceans and listen to the echoes like bats do to image the environment and the weather. Chris - I think the discrimination is active versus passive sound. There are sounds we can make and that’s active acoustics, and passive acoustics is where we’re just eavesdropping on what nature is already providing for us. Philippe - Exactly. Active acoustics or sonar is like sonar for bats or dolphins, we create our own source of sound like a loudspeaker; send the sound, get the echoes – how long it takes to come back tells us how far the target is and how the echo is changed by the target tells us what kind of target it is. Chris - Why does a field like yours exist though? What can we actually learn about the underwater world by listening to it? Philippe - We can learn a lot with these tools. With passive acoustics for example, we can detect sounds even 1500 kilometres away. The oceans are a very big place and we know very little about them. One of the speakers mentioned around 5 per cent. So, we know less about our own planet than other planets like Venus. Chris - You sent me a sound earlier and you’ve described this as coming from a glacier. I’ll just play that… (sound recording) Tell us what that was. Philippe - This starts with a hiss which is a background noise of icebergs in the sea and they're melting. So they're breaking into smaller parts. The small bubbles of air inside create small pops like an ice cube in a glass. And then the big noise, the big bang, is part of a glacier falling off which is a natural process. It’s becoming larger now with climate change. 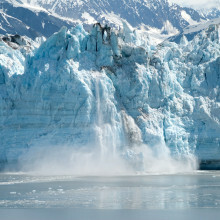 These glaciers add a lot of freshwater and we have big blocks of several tens of tons falling into the ocean. Chris - So does this mean, given that you’ve identified that almost sonic fingerprint for that process happening that by listening for those sounds underwater, you have some idea of how often they're happening and on what sort of scale, and therefore, you have a rate at which glaciers might be melting. Philippe - Yes, and we can do that without being there in person because the polar environments are very dangerous and challenging. We can put instruments on the seabed for years at a time and gather information – not only from this glacier but all the other glaciers around. At the same time, we listen to the waves, we listen to the human footprints or acoustic footprints. So we have a complete view of what's happening under the oceans and what is hidden to us usually. Chris - Here’s another clip you sent me…(sound recording) That one sounds quite different and it has irregularity to it. I’d say that’s manmade. Philippe - Definitely, spot on. This is a ship and we can hear the propeller of a ship going like that (brrrr) and creating this noise. The shipping industry is well aware of its problem so they're trying to reduce their acoustic footprints. But these sounds can travel over very large distances up to hundreds of kilometres away. Chris - What impact –just very briefly – could they have on animals that are exposed to them because they’ve got to live with this noise going on? Philippe - It’s likely being next to a motorway. When there's a lot of traffic, you have to shout very loud to be heard by others. Sometimes you cannot sleep at night. If you're relying not on sight but on sound to find your prey, that’s going to affect how easily you can eat and live around these places. Imagine a tiny, thimble-shaped creature, invisible in water - and deadly. Step up, the Irukandji jellyfish! Izzie - Name: Irukandji jellyfish, phylum: Cnidaria, location: these jellyfish exist in oceans across the world, special abilities: the power of invisibility with the silent but deadly sting. Lisa-ann Gershwin, director of the Australian Marine Stinger Advisory Services makes the case for this week’s Critter of the Week. Lisa-ann - You may them most as pathetic globules of white washed up on the beach but jellyfish pack a punch. One that you really don’t want to mess with is the Irukandji jellyfish. These jellies cause a debilitating illness known as Irukandji syndrome, named after an Australian aboriginal tribe. Imagine a tiny thimble-shaped creature, smaller than a miniature marshmallow and invisible in water. In life, it has 4 tentacles as fine as cobwebs and a hundred times its body length. Izzie - Cute factor: check, home-grown invisibility cloak: check, but don’t be fooled; there's a catch. Lisa-ann - Its sting is worse than anything Hollywood has dared to imagine. Make no mistake. This tiny beast is a killer. The sting itself is often painless and leaves no mark. Half of the victims don’t even know they’ve been stung. Izzie - The Irukandji can fire their stingers into their victim and unlike most jellyfish, you'll also find stingers on the Irukandji’s bell. Lisa-ann - After about half an hour, severe lower back pain begins with patients often describing it as feeling like an electric drill, drilling into the back. Within minutes, relentless nausea and vomiting begin, and can persist for 12 hours. A short time later, the rest of the syndrome kicks in including difficulty breathing, sweating, full body cramps and spasms, restless legs, and a feeling of impending doom. Lisa-ann - Some species also cause severe hypertension or high blood pressure; severe enough to haemorrhage to the brain or cause heart failure. There's no anti-venom but intriguingly, intravenous magnesium stops the whole syndrome in its tracks in many cases. Izzie - So it’s tiny, invisible, and extremely venomous. Where can I avoid this cool but cruel critter? Lisa-ann - Even though most people have never heard of Irukandji syndrome, species that cause it are found in all the world’s oceans; from Hawaii to Boston, to the Caribbean, from southeast Asia to the south Pacific Islands. So why do I think Irukandjis are the best critters? Because anything so small, so invisible, so mysterious, and so dangerous certainly gets my respect. 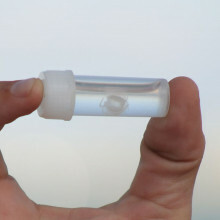 Izzie - There you have it ladies and gentlemen – the ever so small and oh so dangerous, Irukandji jellyfish. Why is it whales do not get the "bends"? Next Why isn't Roger Federer's right arm twice the size of his left?